Called for a locksmith and Ben arrived within 10 minutes was quick and very good customer service! I highly recommend!! Traveling from out of state with rental car. Locked my keys in the car. I had no idea who to trust but I took a chance on these guys. They were awesome! They got to me fast, acted very professional, and the price was completely reasonable. Thanks so much!! I should have read Gerry Coleman's review. Exact same thing just happened to me. Friendly dispatcher, quoted me $60-95 over phone. My keys were sitting on the seat of a 2007 car. Tech came out, told me $46 then two minutes and two gallons later, my keys were out. The totally then came to $95?? The most they charge for most difficult cars?!? I called to give feedback. No one to speak to really. Won't use next time. Update: Lilly called me back and mentioned they will refund a small portion due to the lack of communication. 👍Works for me. Wonderful. I finally decided to upgrade to high security locks after a few break-ins in my area. I expected mediocre service and some slick talking tech who would try to over sell me. But much to my excitement, the prices were way cheaper than I expected and the technician was so friendly! He worked swiftly, didn't try to sell me any bells and whistles I didn't need, and he answered all my questions in detail. I was very impressed! This was so easy and service was SO friendly and just plain simple. I didn't need all the fuss and scare tactics that I was receiving from the other companies I was calling. Arrived on time, was so polite and was so efficient. I would refer to anyone that called and will keep them in my phone in case I am locked out, etc. This team is great! A Star Locksmith is the only locksmith I will ever call again. The levels of professionalism, competency, friendliness, and honesty I experienced were second to none. It would be an understatement to say I feel exceedingly fortunate to work with A Star Locksmith. For two and half days, I must have called close to 80 or 90 different locksmiths. The first 10-15 were the same "front" - all had toll free 888/877/etc. numbers claiming to be able to do anything and everything you want 24/7 - only to give you the runaround, stand you up, deceive you, waste your time and energy, and accomplishing nothing besides frustrating you more - and were likely only 2-3 different companies. After calling three different numbers at 1 am it doesn't take long to realize you are talking to the same person, or hearing the same automated interactive voice response system. The other 50-60 calls were to actual local locksmiths, offering "high-security" automobile services, most with my specific make/model of car. Again, lots of the same runaround and BS. Literally the last call I was going to make before having my car towed into the dealership as a last resort due to the exorbitant costs which were approx. +$1300 to have a new key cut, programmed and matched with my ignition cylinder which was locked and going to have to be replaced/repaired ($350 for key, $650 for ignition + $200 for labor + $100 towing) I called A Star Locksmith who ended up saving me close to $1100 when it was all said and done. I'm not sure if I'm more impressed by that, or the fact that when I called, he picked up the phone while working with another client, and spoke to me long enough to ask intelligent questions and provide honest and candid feedback, but not too long to be rude to the customer he was in front of. He said he would call me back in 10-15 minutes and did exactly just that. I gave him my location, and he provided an amazingly accurate time to expect his arrival, which was only 25 minutes in rush hour traffic. With military-style precision I got a call exactly 25 minutes later. I was only expecting to get a key cut and I was going to deal with the locked ignition cylinder separately. We had discussed this on the phone earlier. He offered an exceptionally competitive and reasonable rate for that service and it would have been very well worth it had that been the entire story. Within 45 minutes of arrival, not only did I have a key cut, but my ignition cylinder had been pulled, adjusted, and completely fixed right there on the spot, without any additional parts. On top of everything else, I found A Star Locksmith to be genuinely concerned about my situation and wanting to help (much like a very good doctor is more concerned, focused, and drive about improving your health than he is about making money off you). I seldom feel the need to "Yelp", because it's rare to have an extraordinarily compelling and positive business experience, and I don't have the time or desire to gripe and complain about how horrible it was to deal with the typical company these days, which is why I won't call out the locksmiths who straight out lied, stood me up, and gave me the run-around. So the rare occasions when I actually do feel compelled to "Yelp" about something, rest assured it's no BS. 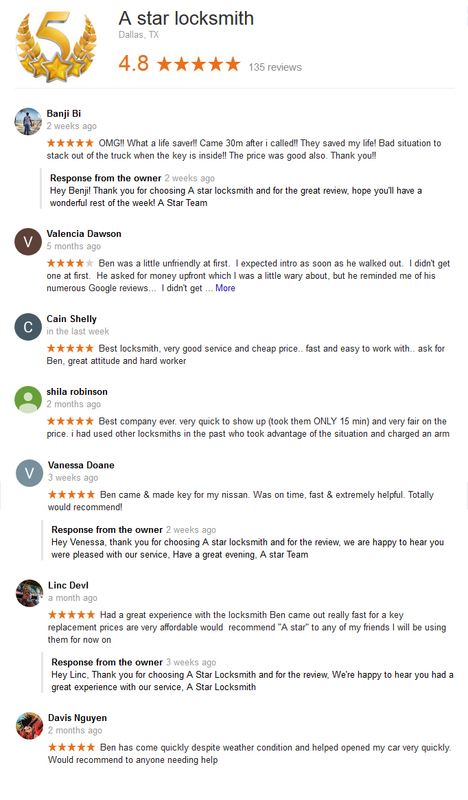 BOTTOM LINE - Don't waste your time, energy and money with any other locksmith, when you can call A Star Locksmith, and receive friendly, first-rate service at an incredible value. I was locked out of my home and in panic. I calles A star locksmith and they quickly came to my rescue! Not only was the technician very helpful, friendly and prompt, but also offered me a 15% discount since I was referred to them through yelp. I'm so glad I called them and will keep their number for future emergencies for sure! For my own personal security, I decided to have my locks re-keyed. I called Raphael and he was able to come to my home the same day. He presented options for re-keying versus replacing the old locks and the pricing for both were very reasonable. There were 5 locks to change out and he did it in less than an hour! Pretty impressive!! Raphael puts you at ease and is very personable. He is serious about his job and takes pride in his work! I highly recommend him for anyone needing the services of a locksmith! teresa. m.
These guys are awesome We went out yesterday night to Flying Saucer and we lost our 2009 jeep liberty key. It was late at night and we called a few companies, but they said they couldn't make our type of key or those that could help could not arrive untill the next day. We panicked, but then we found A STAR LOCKSMITH to come to our rescue. they responded very quickly that night and did a great job for a reasonable price. They even threw in making an extra key for us for no extra charge. I recommend this company to anyone needing a reliable locksmith.